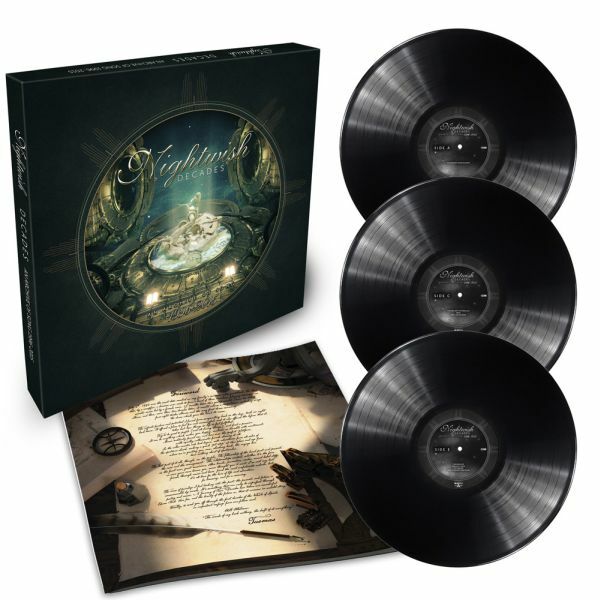 NIGHTWISH - DECADES - BEST OF 1996 - 2015 VINYL (3LP BOX) | Online Shop | Wizard LTD. Album: "DECADES - BEST OF 1996 - 2015 VINYL (3LP BOX)"
Let&apos;s be honest; it does not take any overstated words to present this exceptional band to the world out there, for they are the undisputed pioneers of symphonic metal and the icons of a whole genre. Their virtuosity is consummate perfection, their inspiration lived passion! NIGHTWISH truly understand how to captivate and enchant within seconds. Since the beginning of their career, which started on a mild summer night in July 1996, they have been regarded as the epitome of the most demanding, compositional music art and innovative sound ventures. When creative mind Tuomas Holopainen was sitting around the campfire with friends on a small island in the middle of the tranquil Lake Pyhäjärvi in Kitee and improvising a bit, he probably could not have guessed where this journey would take him.